with this little puppy. He keeps our two pomeranians on their feet with his antics. Since he came into our lives, he has brought back the joy and energy that seemed to be missing over the past year (after the passing of our pom-chi) . From the moment I brought him through the door, he was home. There are no words to describe the happiness we share with Darwin. 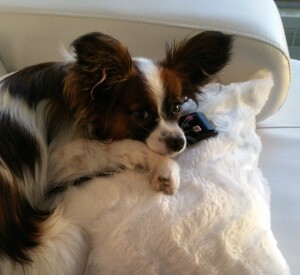 He’s so popular within our community that he has his own Instagram page, Darwinthepapillon. Thank you so much Minpinerie!” What a nice set of ears!